Casa Helena is one of 2 Identical villas. A good sized modern 2 bedroomed villa with a feeling of home. If shown as booked please see our identical villa Casa Alicia. Casa Benedict is a small holiday retreat comprising 2 villas & 2 apartments (Important - to see the other units click on multiple units), so available as individual units or ideal for family & friends to share whilst being independent. Situated in peaceful surroundings near a typical Spanish village, 5 Min by car to the Resort and Beaches of Mojacar and the fishing port of Garrucha. Our Villas and Apartments are set in a garden of three acres planted with oranges, lemons, olives, figs, etc. Large patio area with barbecue around the swimming pool, lovely ornamental garden pond and gazebo for relaxing in the shade. T.V, microwave, washing machine, fridge, iron, etc. Two bedrooms, 1 double, 1 twin, with bed settee in the lounge area to accommodate up to six people per villa. Pool and facilities only used by the villas and apartments so very private and quiet. Panoramic mountain views in all directions. Locality: An enchanting Moorish village, nestled between the Mediterrasnean and the Sierra Cabrera mountains, with narrow winding streets of whitewashed houses opening out into small Plazas. Mojacar is an ideal base from which to explore the real Andalucia- the countryside and villages surrounding Mojacar have altered very little over the centuries. Mojacar's gently shelving beach is over 4 kilometres long, windsurfing and sailing are just two of the water sports available. Browse for bargains in the colourful local markets, centred round authentic Spanish restaurants and Tapas bars. Ambience: If you are looking for clear skies, reliable sunshine and fine beaches, look no further than the Costa Almeria, with at least 300 sunny days a year, and more total daylight per year than anywhere in the world, this part of Spain has the perfect holiday climate. This small complex is owned and run by English couple along with their two dogs Tia a Black Labrador and Mac a Golden Labrador both have been raised alongside children and are very friendly (they get more comments in the visitors book than we do) we are happy to give any help and advice to make your stay more pleasurable. Our complex is newly purpose-built and consists of 2 attached villas, a 2 bedroomed apartment and a 1 bedroomed apartment all totally self-contained around a central swimming pool with a smaller children's pool attached. Set in an area of three and a half acres, planted with orange, lemon, mandarin, grapefruit, olive and fig trees. Each villa comprises two double bedrooms, one with double bed, the other with twin beds. Bathroom and kitchen, lounge/diner, patio doors to dining terrace and spiral staircase up onto rooftop sun terrace. The villa accommodation is designed ideally for 4 people, but can comfortably take six using the sofa bed in the main lounge. We purchased Casa Benedict after deciding to escape the usual drudgery of sitting in Traffic jams on our usual commute to work and after a short break in Barcelona where we loved the Spanish way of life. We also live on the property in an adjoining 3 bed villa. The property was only 2 years old when we purchased it and we wanted to move to Spain but still need a small income to pay our way. We have always had our faithful dogs and we needed plenty of space for them as well. At the time of purchase Jan's Daughter and grandchildren were also living in the area but have now moved back to the U.K.
We fell in love with Casa Benedict on the first viewing and made an immediate offer after sitting on what is now our front terrace enjoying the views of The Cabrera Mountains and the village of Mojacar set at the foot of the mountains. Nice clean shower room with new glass block built enclosure & power shower. Available at extra cost through meter. With low usage panels and gas fire, option to take the air con unit which is heat as well at additional cost. Secure Parking for many cars. Wood burner available in our other unit Casa Alicia for those cosy winter nights. With free to air British Television. At Sierra Nevada Granada a 2 hour drive. A choice of 4 golf courses all a short drive away. Shared only with our other villa and our 2 apartments and ourselves. Swimming pool with separate children's pool. Elevated property giving panoramic views, therefore 5 steps to property being unsuitable for wheelchairs Children's play area with swings, slides, climbing frames, rope walk, etc. Sit and relax in our gazebo overlooking the fish pond or stand on the bridge and watch the wildlife. Air conditioning available at extra cost. Free WiFi Internet access. Beautiful villa, fantastic hosts, great location! Casa Benedict is a beautiful, tranquil villa, in a quiet location off the beaten track, yet only 5-10 minutes from all amenities. Perfect for a holiday location! The pool is fantastic and excellently maintained. Jan and Ian are brilliant hosts - friendly, welcoming and helpful, and so are their 2 dogs! They were so well behaved when we were there, great with the children and a good distraction for our 2. Felt like a home from home! The villa had everything we needed for our children, with lots to do nearby when they needed a change from the lovely pool! The only reason I've not given it 5 stars is because we found the property too hot, particularly at night ( AC recommended in the bedrooms as well as the main living area ), but Spain was experiencing a heatwave when we were there, so ordinarily this may not be so pronounced. We also found the water situation a little awkward ( no mains water for drinking etc; water for cooking and washing up has to be collected each day from storage tanks on site ), but this is just a feature/quirk of the property's location. Otherwise it can't be faulted and comes highly recommended. Thank you Anne for the review. We are so glad you and your children enjoyed your stay with us at Casa Benedict, we must thank you for entertaining our Grandaughter. Jan very much enjoyed the dog walks with your girls. Addressing your concerns over the Air con, I think I did expain that we have the maximum electricity potential available for the property, so we are unable to provide aircon in the bedrooms. The unit in the lounge is a large unit that is usually sufficient to cool the whole villa with fans moving the cool air into the bedrooms but as you pointed out the weather was exceptionally hot. Regarding the water, as with many rural properties in Spain we are not on a mains supply but is supplied from a large Balsa, which during your stay was experiencing some problems. We do as you say have water delivered which we recommend for cooking and making tea and coffee, but the water out of the taps is suitable for washing up dishes. What a lovely place to stay. Clean, bright and wonderfully quiet. Altho we were very late due to a flight delay - we were met and greeted by Ian into his wonderful property. We are definitely going to return. It was so delightful and comfortable . We had a lovely holiday at the Casa Helena, the villa was clean and tidy and had all the amenities that we needed for a 10 night stay, the owners Ian and Jan were always very helpful and answered any questions we had on the location, the local villages are a must to visit and most have market days once a week. We really enjoyed staying here, it was quiet and relaxing. The apartments have all the mod cons necessary to make you feel as if you were in your own home. There's a really nice pool and the the town of Turre is withing walking distance. The beach is only 10 minutes away by car. We hope to return in the not too distant future. We spent 2 weeks in Casa Helena & we couldn't fault it at all, we had the most relaxing & lovely holiday ever. The property was just perfect for us, my sister & family came out for the 1st week & they stayed in casa Alicia which was identical to the villa we stayed in. The property was ideal as everyone had their own space but we were able to utilise the outdoor eating area & pool to all enjoy our holiday together. The villa was very clean with all homely items you could possibly think of being supplied. Jan & Ian were very welcoming & our children & nieces loved making friends with Francesca! The property is perfect for children as its a really safe area, the pool, pond & park proved a big hit with our children. There's lots to do close by, although a car is needed you don't need to drive very far to local supermarkets, restaurants, beaches. The water park & go karting track are all within a few minutes drive. I'd definetly recommend this property to family & friends & hopefully we will be booking again for 2018. 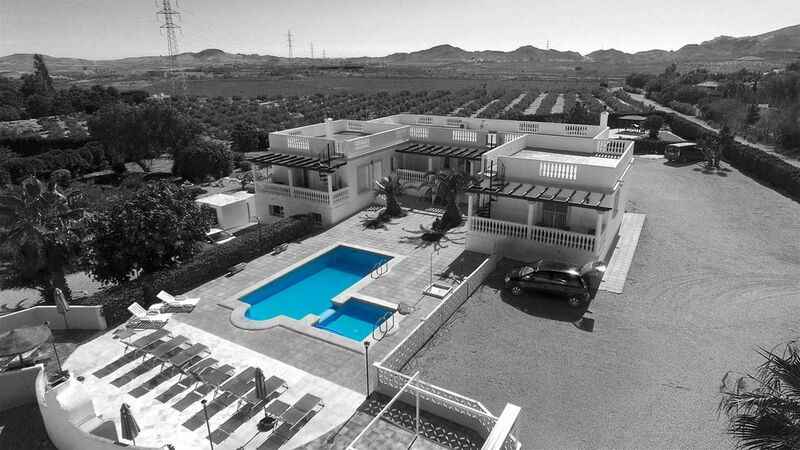 We are situated in a semi rural position near Turre which is 5 Min from the beaches of Garrucha or Mojacar. 10 Min from the Aquapark at Vera and only 5 Min or so to E15 motorway exit 520 which runs from Alicante to the south. Golf: There are several Golf Clubs a short drive away, including the only Desert Golf course in Europe, at Desert Springs, Valle Del Este, Marina Golf in Mojacar and the 9 Hole golf course at Cotijo Grande 5 mins away. In High season we prefer a changeover day of Saturday if possible. Important - the above rates are based on an occupancy of 2-4 persons, for bookings of 5-6 persons please see the rates table. Our terms are 25% deposit (non refundable) to hold & confirm booking, with full payment 8 weeks prior to arrival. We can offer better rates for longer lets over 2 months in our off season only. Our Rates DO NOT include cleaning and we require a 50 Euro deposit on arrival which is returnable upon departure if the Apartment is left clean. Our terms are 25% deposit (non refundable) to hold & confirm booking, with full payment 8 weeks prior to arrival. We can offer better rates for longer lets over 8 weeks in our off season only. Why not email us even if availability is shown as booked as we do get last minute cancellations. Email us if you require any more information and for details of our comprehensive web site.